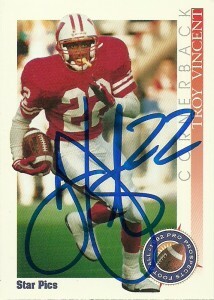 Troy was one of the top defensive backs out of the 1992 class. At Wisconsin, the former Badger finished his career as a runner up for the Jim Thorpe Award, a 1st Team All-American, and the school’s all-time punt yardage leader. With rumors of him going as high as #5 to the Green Bay Packers, Vincent was on the up and up in the hours before the draft. Although the Packers took equally impressive Terrell Buckley off the board with their pick, Vincent didn’t fall far as the Miami Dolphins were there to scoop him up with the 7th overall pick. He immediately was slotted into the lineup in the team’s retooled defensive backfield that was competing in an arms race with the dominant division leading Buffalo Bills wide receiver corps. Turning in a strong rookie season, Troy finished with 2 picks for 47 yards, 77 tackles and a forced fumble, earning All-Rookie Team honors. Although a solid DB, it wouldn’t be until 1994 that Vincent really made a splash- with a 5 pick season and a spectacular 79 yard return for a touchdown against the Chiefs. Then in the following season Vincent had 5 more interceptions, including a 2 pick performance against the Jets, one which he returned for a touchdown as well. With big bucks free agency in session, Troy left the Dolphins in 1996 destined for the Philadelphia Eagles. The Eagles were in a similar circumstance with the Dallas Cowboys, and eager to stay up with them, needing a lockdown opposite Bobby Taylor to replace recently departed blue chipper Eric Allen. Vincent fit the bill of what they direly needed. Troy played the majority of his career for the City of Brotherly Love. There he went on to perhaps have his greatest success, rattling off a string of successive Pro Bowl appearances (1999-2003), led the NFL in interceptions (7- 1999), and earned an AP nomination for his 2002 season. 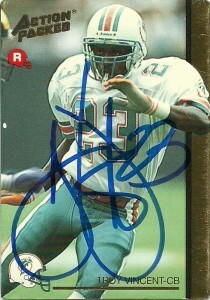 In 2004, Vincent signed with the Buffalo Bills where he was moved to free safety. The move allowed him to extend his career another 3 seasons. A brief stint in Washington brought him back to Buffalo during 2006, and he’d retire after the season having logged some 15 seasons. Troy has immersed himself in charity operations through his “Love Thy Neighbor” campaign and has been involved in the NFLPA for many years. When Gene Upshaw retired, Troy’s name was indeed among the rumored candidates for the job. Vincent has also received some support for the HoF but due to the lack of glamour statistics associated with the position, Vincent has not made it past the semi-finals.